Just Simple…Jamie meets Brianna…a look ahead to a beloved Outlander season 4 scene – My Outlander Blog! I’m republishing because I think tonight is the night! It’s been awhile since I’ve felt inspired to write about my favorite books and show. However, after re reading Drums of Autumn, I found my self itching to pound on my keyboard about a particular scene we are all looking forward to seeing, the meeting of Jamie Fraser and the daughter he never thought to know, Brianna. At this point, I shouldn’t be surprised by the coincidences that happen when I sit down to write about Outlander because guess what they were just filming? Executive Producer Maril Davis’ tweet has confirmed my belief that I must be clairvoyant and, …made me excited to see how the show will handle this particular moment! One of the things I love about the TV version of Diana Gabaldon’s story is the gaps they sometimes fill in, like what would life have been like for Jamie apart from Claire and Claire apart from Jamie, what would the battle of Culloden have been like, and to wander the courts of Versailles. So, I’m hoping we will get to “see” how Brianna decides to go through the stones. Enough time has passed between Claire leaving and Brianna living without her for reflection and maybe regret. Her mother is dead by all that we understand about the laws of nature and physics and yet, she isn’t. She isn’t really an orphan because she can time travel, she can see her mother again, and…meet the father she never knew. Brianna makes the choice to go through the stones and back in time because she has discovered information about her parent’s future and feels the need to warn them. As altruistic as I believe Bree’s motives are, I think at least in part, she takes the risk because she misses her mother and wants to meet her father. Who wouldn’t? Her mother is dead in Bree’s world of the 1960’s and yet, …not. Time travel makes a lot of things at least possible including meeting your “dead” parents. The temptation must have been strong, the chance to be reunited with her mother must have been upper most in her mind, she was living on her own, alone and most certainly longing for her mother. She sneaks off because she is afraid that Roger MacKenzie would stop her or come with her and she needs him to stay in the future. She believes that, in part, a safe trip through the stones depends on having someone in the future or past that “draws” you to them. As is true of most things in the world of Outlander, Brianna’s plans go awry, Roger follows her, and she experiences a multitude of hardships on the road to reaching her parents. Her journey’s setbacks and adventures only serve to build the suspense that will culminate in her meeting her father. We find ourselves holding our breath when it looks like her bond servant Lizzie’s illness may stop Brianna from getting to Cross Creek and cause her to miss meeting her father. While thinking about this scene, I was reminded of the old saying that nothing is as bad or as good as you think it will be. The eagerness and trepidation that Brianna experiences in her search for her parents is heartbreaking and her feelings for Jamie Fraser are complicated to say the least. He is her father because her mother told her so, but she has had no experience of him. She is told he loves her, in fact, she has been told that her father sacrificed the one thing that meant the most to him to keep her safe. He sent her mother back through the stones for his unborn child’s sake, her. All she really knows of her father is contained in the stories her mother has told her and I couldn’t help, but believe that Jamie Fraser must have seemed like the stuff of fairy tales to Brianna. He couldn’t have been less real to her than the tales of King Arthur and yet, she knows he is real. You all know that I longed for the moment in the print shop when Jamie falls apart in Claire’s arms, the moment when he realizes that Brianna is safe and all his sacrifice was not in vain. It wasn’t quite what I got, but what I did get was wonderful in its own way. This scene, I’m sure, will come with its own set of fan expectations and I’m sure the writer’s and actors know this. However, I find myself more ambivalent about this scene than the print shop. Quite frankly, I’m not sure what they will do or if the way Diana wrote the scene would play well on the screen. She played with my expectations and it took me awhile to appreciate how the author told this part of the story. When I first read the “reunion” (is that what it was? ), I’ll admit it felt a bit anti-climatic and left me feeling somewhat disappointed. I’m not sure what I believed it should have been, but I think I was expecting a lot more overt emotion. I have certainly had time to reflect and re read that scene and now find Diana’s choice to write this with some subtly a bit of genius. Brianna had most certainly built this moment up in her head. In fact, she shares that she had gone over the moment she would meet Jamie in her mind again and again, what would she say, what would he say? Her expectations of the moment and her father had to have reached “bigger than life” proportions. So, how does Diana subvert the expected and turn our notions of what should happen on their head? Well,…she has Brianna rush out of a tavern, hard pounding in expectation of finally seeing her father, and …finds him peeing on a tree. Brianna’s first glimpse of her father made him seem human pretty quickly, just a man after all. The scene that follows, I have now come to realize, is just what Brianna needed. Jamie of course doesn’t recognize her. Why would he, she is the last person he would expect to see. Because he doesn’t know who she is and because Brianna can’t quite find her voice or the words to tell him, he interacts with her without that knowledge and as a result reveals his character to her. She learns more about who this man is in the few minutes he doesn’t know who SHE is than she could have ever learned in all the “stories” she was told. He sees her staring at him and asks her why she is there in a voice that is sharp, but not unkind. She manages to blurt out the single word ,”You”. Jamie looks her up and down in her male “costume”, raises an eyebrow, and with a half-smile says ,”Sorry, lass I’m a marrit man”, and tries to walk past her. She stops him and he once again tries to courteously disengage, but something makes him take a closer look at her. She is able to observe him observing her general grubbiness and realizes he thinks she is destitute. His tone changes and he reaches for his purse to give her some money to eat, kindness shining in eyes so like her own. 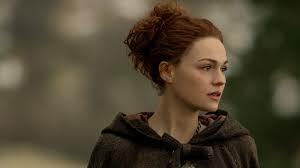 Brianna manages to ask him if he is Jamie Fraser, he is now wary and looks toward the tavern. Thinking she may have been sent to him, he quietly asks if she has a message for him. Brianna is struck by the absurdity of it all, a message? She almost laughs and finally tells him her name. She watches his face and realizes he knows it, and feels joy at the knowledge. He is obviously experiencing shock and it takes him a moment to catch up. Poor guy, people are always showing up unexpectantly into his life. He, of course, says exactly the wrong thing and comments on her size, lol! At her indignation, his face cracks, and he quickly reassures her with an expression of “half-painful eagerness” on his face. He asks if it is truly her and then explains with a gentle touch to her hair and face that his surprise is that he never thought of her as grown. As always, Jamie thinks of Claire and his face breaks out in a wide grin at the joy he knows Brianna’s coming will bring his beloved wife. Brianna realizes her mother has found her father and it is all suddenly too much. He hugs her, cries with her and worriedly comforts her. She gives her nose one last wipe and asks him the meaning of the Gaelic words A leannan and M’ annsachd. He tells her they mean darling and blessing. The tender words of endearment cause them both to be shy. Brianna starts to speak and realizes she doesn’t know what to call him. It is all so complicated. Father seems to formal, and she can’t call him daddy, Frank was her daddy and to call him this would seem a betrayal, and she certainly couldn’t call him Jamie! True to form, Jamie sees her discomfort and interprets it correctly, and tries to help alleviate her distress. “You can…call me Da, ” he said. His voice was husky; he stopped and cleared his throat. “If—if ye want to, I mean, ” he added diffidently. And, as Diana writes, it suddenly was. Brianna steps into her Da’s arms and what they experience there is all they both dared hope. He is as “big” as she imagined and Jamie is holding his lost child. And, I can’t wait to see how Ron and company, Sam Heughan, and Sophie Skelton will realize all the emotion, realization, and…hope in this scene. It was so wonderful to see a post from you today and I saved it so that I could savor it during my lunch break at work. I am hoping, as you and everyone else are, that the scene will live up to expectations. I can’t wait to see them together! I look forward to your insight as much as Diana’s Daily Lines and the Outlander Anatomist’s post. Thank you for your writing. Thanks for this! I am thinking that this scene, like other “important” scenes , will require many revisits, partly because of our expectations, and partly because it will be a real treat to see Jamie and Bree together AND Sam and Sophie together. Like every episode, I will try very hard to view with fresh eyes and an open mind! Oh Beth it’s so nice to have you back 😀 I’m truly looking forward to Jamie and Brianna’s meeting too. I’m confident Sam & Sophie won’t disappoint. Next will be Claire’s reaction . So much to look forward to in Season 4. Hi Kate! I agree I think there is a lot to look forward too! This is going to be a great scene! Jamie loves children, wanted many (“one for each spoon” remember!) and had bad luck with faith, no hope with William. Fergus is his “adopted” sun and so are Marsali and Joanne McKimmy. The meeting between him and HIS ONLY LEGAL daughter is unexpected. And must be a gorgeous scene in the series. It must! So, wait and see. Don’t give up on Willy. thank you! love hearing from folks again! It is so great to read your thoughts once again. You reminded me that I should like to re-read Drums of Autumn before the next season airs. I do remember thinking the first face-to-face meeting between Brianna and Jamie was a bit anticlimactic, at least at first it seemed so. But after reflecting on it, and with the help of what you wrote, I liked it a lot more on the second this reading. And, of course, the show might be even a bit different, once the directors and actors bring it to life. I am looking forward to seeing that! yes, very often I find when I feel differently about a scene after some reflection. What she learned about her father intros few moments was priceless. Great to have your opinions again and I agree wholeheartedly! 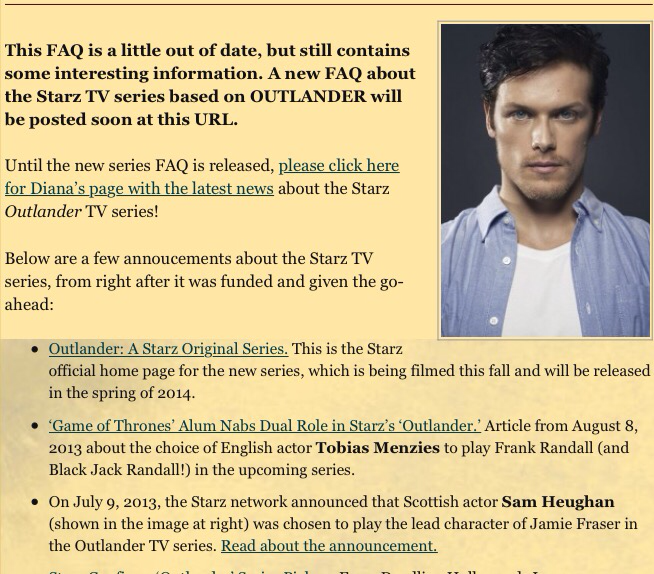 Having seen how SAM can play Jamie’s emotions on his face so well, I am sure it will be a great scene! he has truly got an expressive face! Wonderful, Beth! Thank you! You made tears come to my eyes. Oh, this Reunion may be even better than the previous reunion! I am so happy to see your post after all this time! Your analysis of the books help me appreciate them even more as you clarify things in your own inimitable way. I just re read the moment you described..so thank you…I’m curious to see how it will play out by Moore and company. All the feels!! Yep had tears in my eyes. I’m looking forward to seeing this scene very much! Great as always Beth! I so look forward to this next season!! I actually think Brianna doesn’t want Roger to come so she can return. Thank you for writing this. This and the print shop are fabulous scenes. And the return of Roger when there is too much testosterone poisoning! Yes, yes, yes! The hope…and the love! I can’t wait to see it! Lovely to see you back again. Well thought out and written. Thankyou. 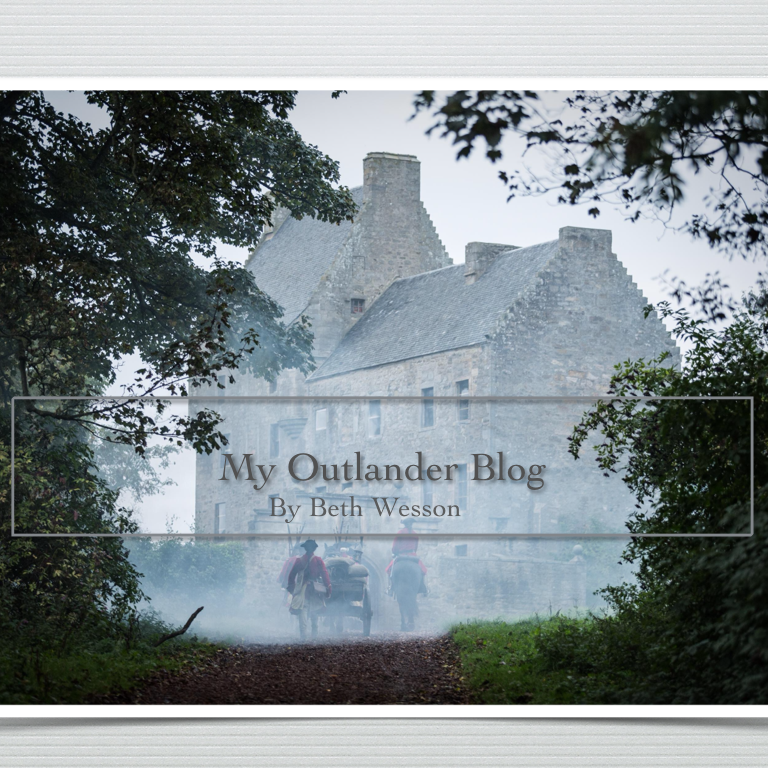 I had no idea there was a blog about Outlander on WordPress! I am thrilled! I love that series and I faithfully watch it and watch it again and again. A truly great story! Glad you found me! lots to read here I’ve been writing about the books and show for over 4 years! I’m so pleased to read another one of your well-written blogs! You always express my feelings. Just like you, I wanted a bit more emotion from the reunion scene in S3. I felt that Diana’s description of Brianna’s and Jaime’s meeting needed more also, but what she wrote was wonderful. I especially liked the cascade of emotions in such a short period. Their misunderstandings mirrored natural occurrences in real life. Thank goodness Jaime had the good sense to explain himself for calling her large! I am confident the actors will give it their all; I hope the writers give them enough time to do justice to the scene. I look forward to your next blog! Beth, thank you! This passage in your blog — You all know that I longed for the moment in the print shop when Jamie falls apart in Claire’s arms, the moment when he realizes that Brianna is safe and all his sacrifice was not in vain. It wasn’t quite what I got, but what I did get was wonderful in its own way. — really got me. After all this time, I too, was not with the show’s interpretation of this scene, which should have been exactly as you have described it. Very disappointing. It’s the one deviation that just did not work for me. But okay, I WILL get over it. I love your insights into this magical and wonderful story and I am looking forward to the next season. No TV show or series has ever captured my heart and imagination the way Outlander has! And keep on blogging! Well done. My initial reaction to the “reunion ” scene was exactly the same as you described! I hope they are able to keep it as close to Diana’s description as possible, but I’m very sure the writers will come up with a good job and that Sam and Sophie will do a great job. Can’t wait to see it! thanks for joining the convo Jacquelyn! Oh Beth, thank you for your post! I have been meaning to go back and check that scene for details, and now, unless I decide to reread the entire book before season 4 airs, I won’t have to! So eloquently written! I always enjoy reading everything you write! Thank you for reminding us about realistic expectations, just as Diana did for Brianna when she wrote that Brianna’s first view of Jamie was to see him relieving himself! We’ll have to be open minded, and have faith that Ron, Maril, and the writers will do well by us as they interpret this scene for television. I have to remember how wonderfully they handled the last scene of episode 4, Of Lost Things. Just beautiful as Jamie rides away from Helwater, and little Willie. Some things are almost better on the show than in the book, such as The Wedding episode. One last thing, do you want to know what I am hoping for in the scene where Jamie and Brianna meet? I am hoping that the writers understand that many viewers were disappointed with the reunion scene, and that Jamie did not “quietly go to pieces in Claire’s arms” upon seeing Brianna’s pictures. Seeing how much everyone was so moved by how they showed Jamie leaving Willie at Helwater, perhaps they will choose to have him be more emotional during the scene with Brianna as well. That would make up for a lot, wouldn’t it? We shall see! I haven’t read the books, at least not yet, because I want to be surprised by the show, inasmuch as that’s possible with everything I read. I knew that Brianna and Roger would both travel back to meet Jamie, but your post has made me look forward to that meeting with great anticipation. I think I’ll enjoy it even more than Jamie and Claire’s printshop reunion. Thanks so much for your posts, and please don’t worry about “spoilers.” We can handle them. Good to have you back…I’ve always enjoyed your interpretations. I’m thrilled to have you back, and it is balm for Droughtlander! ‘Tender’ is my favorite one word explanation for all of Outlanderworld. Tender love, tender pain, tender hurt, a tender injury, tender feelings, tender touch, tender hope, tender love of many kinds. My own hope to see a tender DG scene not found on film is the grotto scene at the end of book one. Still hoping that it will be placed forward in time! !